Appearance, practicality and performance should be front of mind when choosing the right door system to suit your individual project. Introducing floor-to-ceiling glass doors into the home opens up the property, giving year-round natural light, fresh air and abundant views. With aluminium systems from Reynaers at Home, you don’t need to worry about thermal insulation as its extensive range boasts high-performance products that will keep your home warm, and could even save energy. Not only that, but sliding patio doors and bi-folding patio doors are available to suit all design and functional requirements. Rebecca Cope, Marketing Manager at Reynaers, explains the most important things to think about when choosing doors for your home. When looking at different types of doors, it’s worth noting that bi-folds open up about 90% of the total frame size or aperture, whereas sliding patio doors by comparison typically open 50-65%. When the doors are closed, however, sliding doors offer the most uninterrupted views as they consist of fewer, wider door leaves with bigger panes of glass. Bi-fold doors have more door leaves, each with a frame around them. Sliding patio doors can be specified in an ingenious open-corner solution from Reynaers, whereby two perpendicular doors slide open away from a corner that has no fixed post. This feature results in a cantilevered ceiling that appears to float, and truly removes barriers between internal and external spaces. The type of threshold you have will also impact the overall look of the door. A flush threshold, whereby there is a continuous floor with no step between inside and outside, gives the smoothest appearance. However, flush thresholds are not the best at keeping out the wind and rain. Doors in more exposed locations may need a slightly raised threshold to provide the best weather ratings. Reynaers bifold doors come with a choice of four different threshold heights, so your doors can be specified to meet your needs. You can design your bifold door so that all the leaves stack to one side or you can choose to have some stacking to one side and some to the other. Since the door leaves need space to swing when opening and closing, it is worth considering the location of any furniture or plant pots that may get in the way. You can also choose whether the leaves open inwards or outwards. Many people choose to have the doors opening outwards so that if the doors are wet after rain, they can be opened without the rainwater dripping onto the carpet. Of course a sliding door needs no such considerations as they open and close along the track; though you can choose which doors slide and which are fixed. There are a number of bi-fold door designs to choose from, including several that incorporate a traffic door. Typically found when there is an odd number of door leaves, traffic doors are single leaves that operate like a ‘normal’ back door and can be opened by themselves for ease of use when popping in or outside. If you want to open the door for ventilation, patio doors offer the most flexible options as you can open the door only as far as necessary to make the room comfortable, as opposed to opening an entire door leaf at a time. Most people expect a large sliding door to require a bit of effort to open; certainly this is the case for many standard sliding doors, although it does not have to be so. 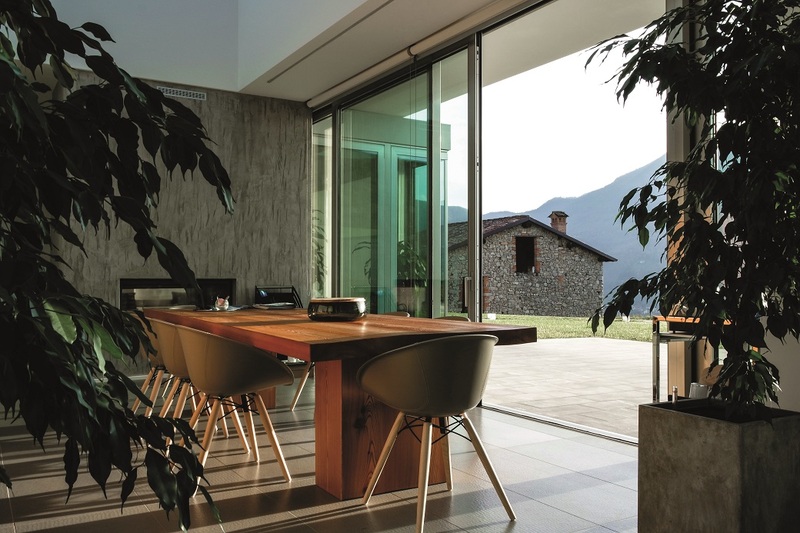 Reynaers’ lift-and-slide doors offer a state-of-the-art solution whereby the door is fitted with a slightly longer handle and a very clever sliding mechanism. Turning the handle through 180° lifts the door by a few millimetres and so reduces the friction between the door leaf and the frame. This makes it possible to open even a large door leaf with the lightest of touches. Alternatively, for something really special, Reynaers’ Hi-Finity door can be fully automated, so that a huge pane of glass weighing as much as 750kg can be opened and closed at the push of a button. Reynaers systems also offer market-leading security and weather resistance. This means you can have huge doors up to 3.5m in height and stretching across the whole width of the building, without compromising on warmth or safety in your home. Next Which security standard should I look for when buying sliding doors?